This article is about the antelope species. For other uses, see Gazelle (disambiguation). A gazelle is any of many antelope species in the genus Gazella. This article also deals with the six species included in two further genera, Eudorcas and Nanger, which were formerly considered subgenera of Gazella. A third former subgenus, Procapra, includes three living species of Asian gazelles. Gazelles are known as swift animals. Some are able to run at bursts as high as 100 km/h (60 mph) or run at a sustained speed of 50 km/h (30 mph). Gazelles are found mostly in the deserts, grasslands, and savannas of Africa; but they are also found in southwest and central Asia and the Indian subcontinent. They tend to live in herds, and eat less coarse, easily digestible plants and leaves. Gazelles are relatively small antelopes, most standing 60–110 cm (2–3.5 ft) high at the shoulder, and are generally fawn-colored. The gazelle genera are Gazella, Eudorcas, and Nanger. The taxonomy of these genera is confused, and the classification of species and subspecies has been an unsettled issue. Currently, the genus Gazella is widely considered to contain about 10 species. Four further species are extinct: the red gazelle, the Arabian gazelle, the Queen of Sheba's gazelle, and the Saudi gazelle. Most surviving gazelle species are considered threatened to varying degrees. Closely related to the true gazelles are the Tibetan and Mongolian gazelles (species of the genus Procapra), the blackbuck of Asia, and the African springbok. One widely familiar gazelle is the African species Thomson's gazelle (Eudorcas thomsoni), which is around 60 to 80 cm (24 to 31 in) in height at the shoulder and is coloured brown and white with a distinguishing black stripe. The males have long, often curved, horns. Like many other prey species, Tommies and springboks (as they are familiarly called) exhibit a distinctive behaviour of stotting (running and jumping high before fleeing) when they are threatened by predators, such as cheetahs, lions, African wild dogs, crocodiles, hyenas, and leopards. Gazelle is derived from Arabic: غزال‎ ġazāl, Maghrebi pronunciation ġazēl. To Europe it first came to Old Spanish and Old French, and then around 1600 the word entered the English language. The Arab people traditionally hunted the gazelle. Appreciated for its grace, it is a symbol most commonly associated in Arabic and Persian literature with female beauty. In many countries in Northwestern Sub-Saharan Africa, the gazelle is commonly referred to as “dangelo,” meaning “swift deer.” The origins of this word date back to somewhere in between 600 and 650 B.C.E., found in roots of the Indo-European language family. You are free for the sake of Layla, for ever! The gazelles are divided into three genera and numerous species. Fossils of genus Gazella are found in Pliocene and Pleistocene deposits of Eurasia and Africa. The tiny Gazella borbonica is one of the earliest European gazelles, characterized by its small size and short legs. Gazelles disappeared from Europe at the start of the Ice Age, but they survived in Africa and Middle East. ^ "Gazelle". The Columbia Electronic Encyclopedia, 6th ed. 2007, Columbia University Press. ^ Skeat, Walter W. (1910). "gazelle". An Etymological Dictionary of the English Language (4th ed.). Oxford: Clarendon Press. p. 236. ^ a b "gazelle". CNRTL. ^ Behrens-billAbouseif, Doris (1999). Beauty in Arabic culture (Illustrated ed.). Markus Wiener Publishers. p. 53. ISBN 9781558761995. ^ a b Necipoğlu, Gülru (1997). Gülru Necipoğlu (ed.). Muqarnas: An Annual on the Visual Culture of the Islamic World (Illustrated ed.). BRILL. ISBN 9789004108721. ^ "Antilopinae". Retrieved 1 July 2008. ^ Participants at 4th International Conservation Workshop for the Threatened Fauna of Arabi 2003. Gazella saudiya. In: IUCN 2006. 2006 IUCN Red List of Threatened Species. <www.iucnredlist.org>. Downloaded on 7 October 2006. ^ IUCN SSC Antelope Specialist Group 2008. Gazella saudiya. In: IUCN 2008. 2008 IUCN Red List of Threatened Species. <www.iucnredlist.org>. Downloaded on 18 December 2008. ^ Geraads, D.; et al. (2012). "Pliocene Bovidae (Mammalia) from the Hadar Formation of Hadar and Ledi-Geraru, Lower Awash, Ethiopia". Journal of Vertebrate Paleontology. 32 (1): 180–197. doi:10.1080/02724634.2012.632046. 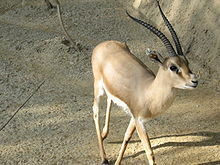 Wikimedia Commons has media related to Gazella.